This afternoon has been a putter-around-the-house-until band practice kinda space – particularly as 1) I drank a little too much at our bbq last night and 2) It’s raining outside. The first rhubarb ketchup of the season is simmering away on the stove as I write this, and I’m plotting two kinds of mustard to start soaking after I get this post up – I am definitely feeling the start of a new food season upon us as I pulled the last of the blueberries from 2013 our of the freezer and weighed them for the Blueberry-Pomegranate Wine I have been thinking about for the last couple of weeks. Again, this recipe comes from True Brews and makes a one gallon batch. According to the book, this comes out the most like red wine of any of the fruit wines so I’m curious about that. 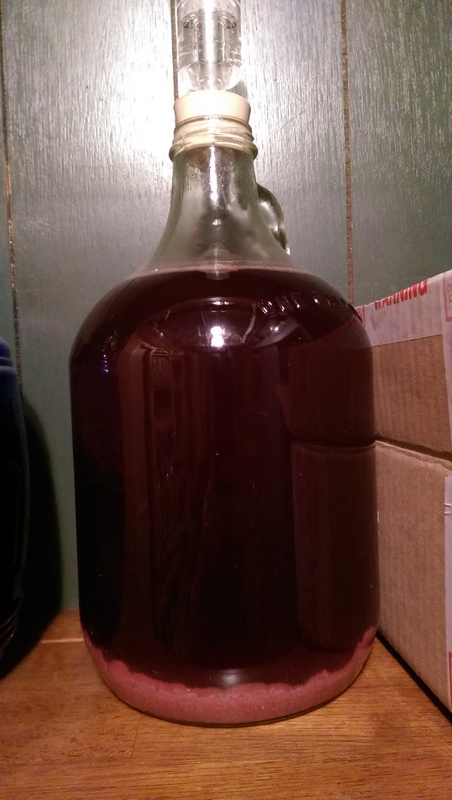 Before I go any further I want to point out the picture up top – which is the blueberry-lavender mead I posted about earlier this week. As you can see from today’s picture, the mead has clarified a lot, and there is now quite a bit of sediment at the bottom of the jug. If I age this beyond 1 month, I will siphon it again before letting it sit – purpose being to clarify the liquid as much as possible with each racking. Anyhow – today’s recipe calls for 3 pounds of blueberries, 2 cups of pomegranate juice, 5 & 2/3rd cups of sugar and 12 cups of water to start out (plus a Campden tablet). I started with the blueberries frozen and weighed them on the kitchen scale. I have read elsewhere that using frozen blueberries in liquor-making is optimal because the freezing and then thawing of fruit brings out its sweetness – think ice wine. I’m not sure if this is true, but I’m pretty sure that using frozen fruit can’t hurt the process in any way. 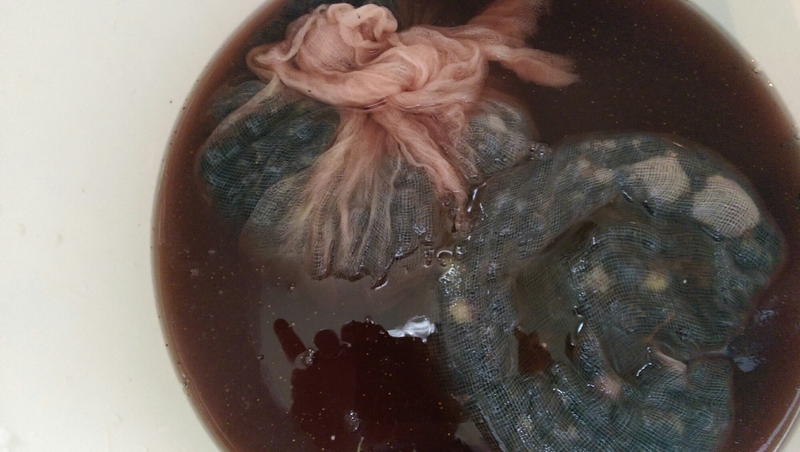 I thought I had several mesh bags to secure the fruit in, but it turns out – I had none – so I wrapped my blueberries up in cheesecloth instead (note to self – buy more cheesecloth and mesh bags). I keep quite a bit of fabric in the kitchen these days for just such eventualities. Pomegranate juice isn’t something that I normally buy – it’s rather expensive ($9 for a bottle) and a bit tart for everyday drinking. I just grabbed the stuff from Donald’s market that was not blended with other fruits. There was no way that I was going to purchase enough pomegranates to make my own pure juice – I figured this was the next best thing. The process for making the wine is very straightforward: After sterilizing all the tools you are about to use, combine the sugar and water on the stove and bring to a simmer. Don’t boil it, you are essentially just heating it until the sugar dissolves. Once the sugar is combined, take the pot off the heat and let the mixture cool down to room temperature. Combine the sugar-water and pomegranate juice in the primary and then add the bag(s) of fruit. Using clean hands or a sterilized potato masher, get as much juice out of the fruit as possible . Once everything is mixed together, crush a campden tablet and snap on the lid with an airlock. (You can take your original hydrometer reading before putting the lid on, but I forgot so I will take mine tomorrow when I add the yeast). And that’s it! For about $10 in ingredients I have another 3 bottles of wine on the way. ← Starting a new stitch.